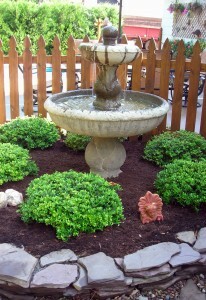 Hire professionals for the overall design of your garden, then have fun adding to it. That’s the advice of Chuck and Nancy LaChiusa, whose gardens at 140 Fernwood in Grand Island were on the Grand Island Garden Tour July 17. They gave us a preview the day before the walk. The LaChiusas started off about six years ago with an annual garden, but turned to perennials to decrease the amount of maintenance. Sculptures also play a large role in their landscape design. It’s an idea they got from going on garden tours. Nancy scouts out art shows and just chooses what she likes. They lean toward the unusual, such as this rendering of the food chain. The LaChiusas are fond of water, which is why they chose to live on Grand Island, near Beaver Island State Park. They have a lap pool in their yard, and a koi pond was still under construction when we visited. They put the fountain in three years ago. When it comes to plants, Nancy suggests using flowering shrubs. 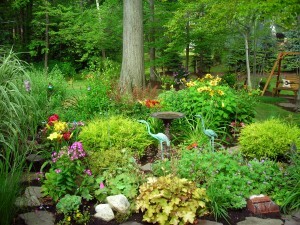 They take up space so you don’t have to plant so many annuals. Evergreens also add winter interest. Don’t overlook ornamental grasses, Chuck added, which also add winter interest. 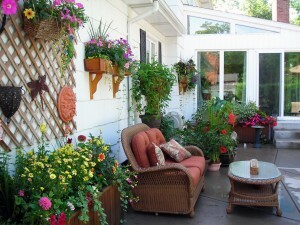 Container plantings in pots on the floor and mounted on the wall add color and freshness to the patio. Chuck, who hosts a web site called Buffalo Architecture & History, notes that his gardening experience has influenced his photography. Now when he takes pictures of buildings, he’s more likely to include the surrounding landscape. I have subscribed to this site as we have come back to Buffalo after 4 years in Florida. We purchased a house in Depew & would like to find a landscaper for our back yard along the fence. I would like a 4′ x 40′ area designed for us. I know what I like & would like to tribute this design to my late Father who passed away in October 2011. He was an excellent gardener & this is love project for me. Can you help me find landscapers in this area? That sounds like a wonderful project! I can see why you’re excited about getting started now. I would refer you to the Western New York State Nursery and Landscape Association. On the left, you’ll see an option for “Find a Professional.” That should help you. Also, this group sponsors Plantasia, coming up March 22-25. There will be many landscapers exhibiting, so you can talk to many all at once. I’ll have a booth, too, so stop by and say hello.